Isnw_ecp This is a unique opportunity to secure all (5) five original release 1954-55 Elvis Presley Sun Records (Memphis TN) 45rpm vinyl records, representing one of the very seminal moments of American music, and specifically, the birth of BIG rock and roll. 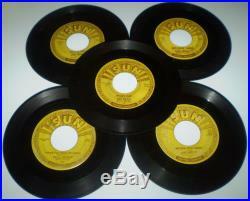 I'm more of a shellac (78rpm) guy than vinyl so I'm not comfortable assigning them each a super specific grade. I'll provide as much information as possible with photos and audio so you can make your best determination. I describe them as being in rough shape, scratches, groove wear, loss of gloss, etc, but listen for yourself to all 5 start to finish in the player. I played them on my Audiotronics classroom record player and recorded them with the mic on my laptop. Some are worse than others, you'll notice a few start worse and get better. Please note, this is basically a primitive record player I use because 78s sound great on it. It doesn't have any tracking ability, weighting, etc and uses a generic double sided needle cartridge that I choose based on 78 rpm playback. Timestamps of the starts of the song to the left 0:05 #209 That's All Right U-128-45 72 (push marks are tough to make out, underneath some wear, but they're there, both sides) 2:24 Blue Moon of Kentucky U-129-45 72 (Skips start around 3:38) 4:26 #210 I Don't Care If The Sun Don't Shine U-130-45 72 7:00 Good R0ckin' Tonight U-131-45 72 9:17 #215 Milkcow Blues Boogie U-141-45 72 11:59 You're a Heartbreaker U-141-45 72 14:18 #217 You're Right I'm Left She's Gone U-142-45 72 (seems to be earliest pressing, see down below) 16:53 Baby Let's Play House U-143x-45 72 (There are surface issues as you can hear causing muted sound/issues early on, also skips at end last verse right after'another man' listen to hear) 18:56 #223 Mystery Train 45-U-156x 20 (seems to be earliest pressing, see down below) 21:25 I Forgot to Remember to Forget 45-U-157x 20 As far as pictures, I took one picture of each side, one with flash, one without, but could only include one or the other, so I chose the flash ones since you can see the most defects. Request the others, I'll send them to you. The flash makes the vinyl look less black. The labels look better in person as far as the depth of the yellow. The flash tends to lighten it and no flash is dark. On'You're a Heartbreaker' #215 label, you can see yellow underneath the white piece of paper that's on the label, so it's possible you could remove that white piece of paper leaving the yellow label underneath. If it were a 78, I'd have done it myself. It's also possible you're tear an even bigger piece of the label off, so maybe not the best idea if you don't do it all the time. I don't know if that makes them extra rare or valuable. I didn't look up the others. 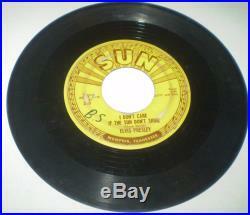 Rare opportunity to get all 5 Elvis Sun 45's in one swoop. Ask any questions, I'll do my best to answer as quickly as possible. The item "Complete Set All 5 Elvis Presley Sun Records ORIGINAL 45RPM 209 210 215 217 223" is in sale since Friday, April 21, 2017. This item is in the category "Music\Records". The seller is "rockbottoms" and is located in Grapevine, Texas. This item can be shipped worldwide.